Crosspost from AZ, and photos already posted to IG ... but figured I'd share across platforms for those who don't venture outside AudiWorld. 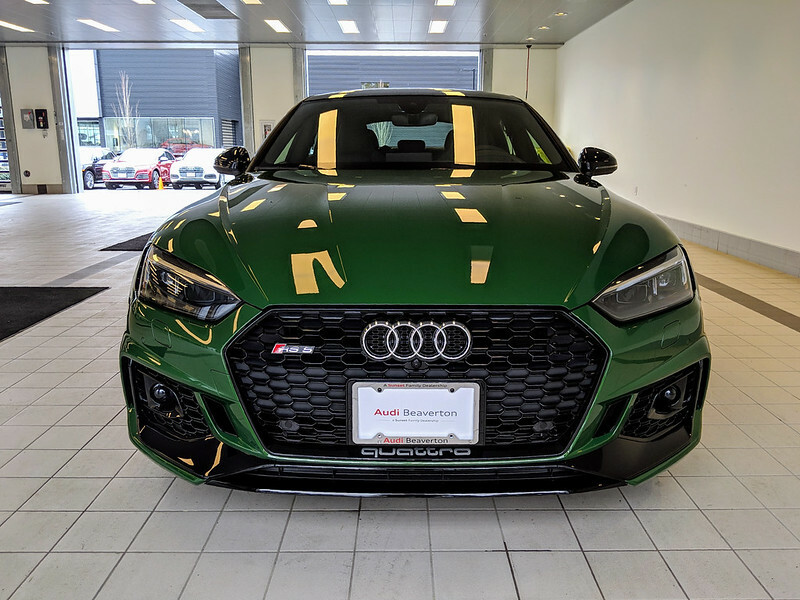 So, I was originally #1 on the list to order an RS5 Sportback at my dealer. As far back as Feb 2017, when collecting my wife's new SQ5, I requested to be on "the list" if there was one. Then, once the model was formally introduced by Audi, I had my order position secured. Fast forward to September 2017, when the books opened for customer orders. I had just broken my right foot and been through major surgery, leaving me with a non-weight bearing injury and no driving for at least 3 months. My mind was not on cars at that time. Add to that the fact I'd driven an RS5 Coupe over summer and was left totally unimpressed. Because of those circumstances, combined with the fact my S5 Sportback was all dialed in (and a great car), I passed on ordering an AE Merlin Purple over Lunar Silver RS5 Sportback. And now I'm glad I did. 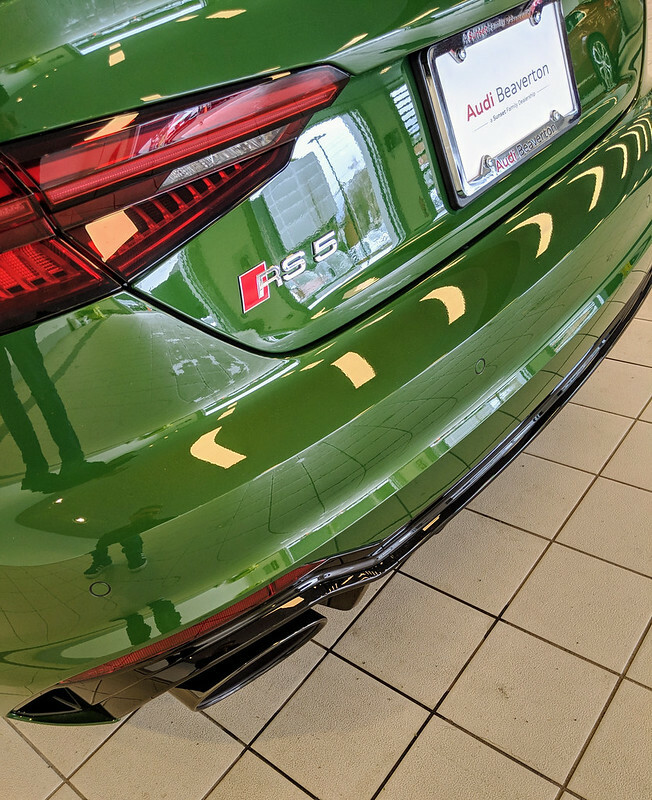 About a month ago, while at the dealership for service on my S5 SB, I had my first real look at the RS5 SB in person. It was stunning. As I've said to a number of people now, I can't believe the presence this car has; photos don't do it justice. In fact, it made my beautiful S5 Sportback look pedestrian. I decided 'what the hell' and took one for a test drive. I was impressed. I couldn't believe it was effectively the same car as the Coupe I'd sampled; the SB felt completely different. That drive, and those looks, left me wondering if I'd missed an opportunity by not ordering one at the start. Doing an AE order now was out of the question ... with massive delays already on cars ordered in September, and at least a 6 month wait. So I went home to think about it. What about color then, if not AE? 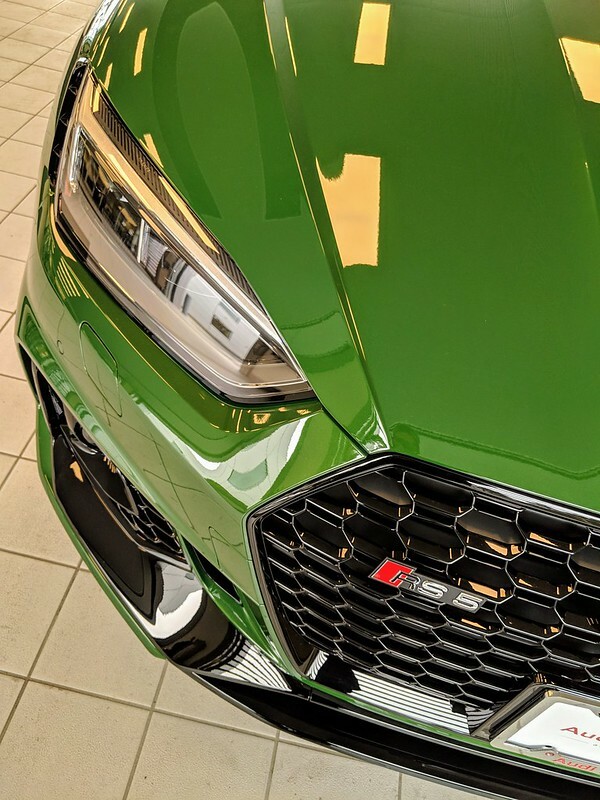 I'd already been a fan of Sonoma Green, which Audi had been using on press cars from the beginning. At least in photos. Not being a green car kind a guy though, I hadn't really thought about buying one even if I thought it a stunning color. 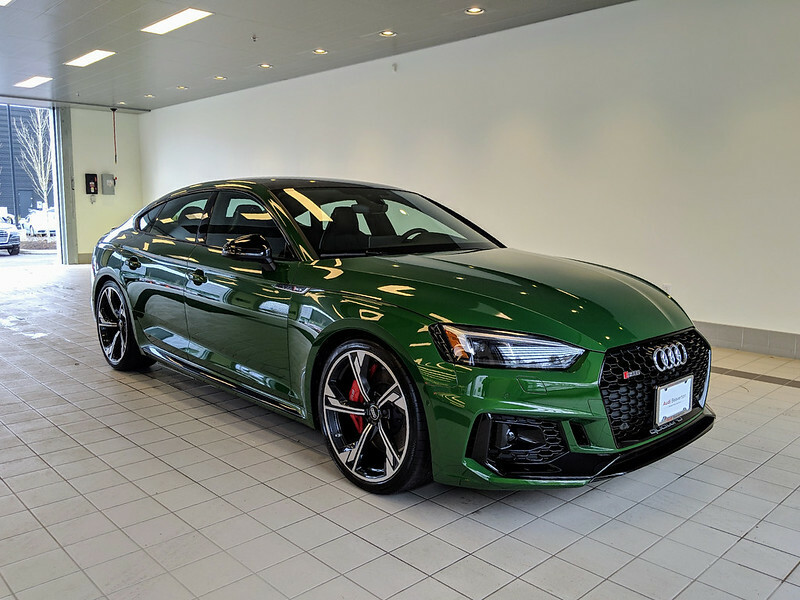 As it turned out, my dealership (Audi Beaverton -- great to work with) had two identical Sonomas in production and about a month out. So I put my name on one of them. Having never really seen Sonoma in person, and with a few weeks to think about whether green was the right color, I waffled a bit. My dealer had 10 cars on the lot, several with my exact spec, and another 8 or 9 inbound. Plenty to choose from that weren't green. I even searched dealer inventory nationwide to ensure I was getting the right car. 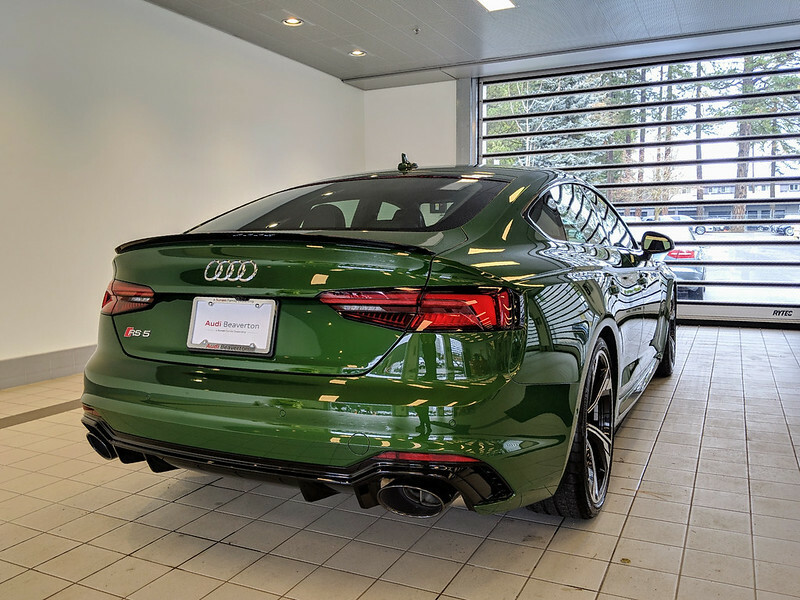 In doing that, I found that only about 5% of listed dealer inventory were Sonoma Green (and I probably looked through over 300 units total). That sort of sealed the deal for me, as I'd wanted something exclusive. Something different. 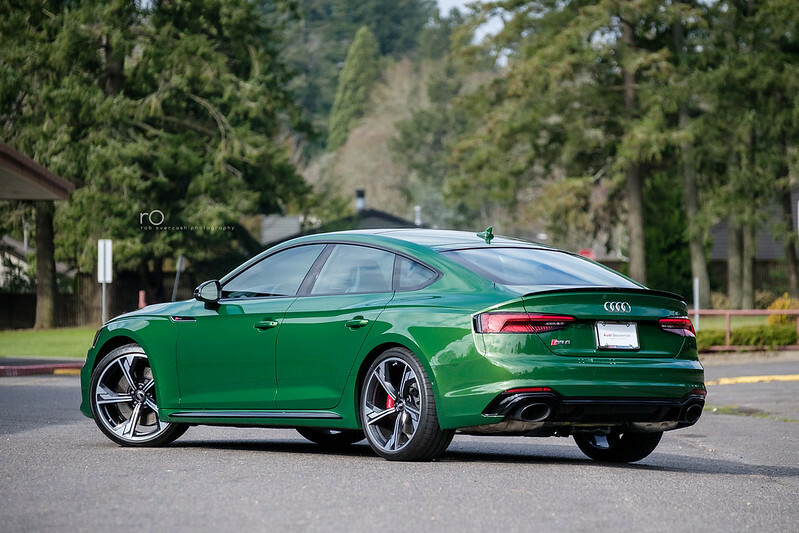 Sonoma Green is exclusive to the RS5 (for now), and would require Audi Exclusive on any other model. That, and the low number of dealer orders so far, make it a pretty special color. Well ... it arrived on Friday. Good gawd this color is amazing. Zero regrets, save for thoughts about NOT getting it; I do regret considering other colors. LOL. The only major option my car didn't have that I would have ordered was BO + CF Pkg. I *love* the CF with Sonoma, so I'll retro fit it with OE parts. Sadly, that package is a bargain from the factory, at roughly $4k over standard BO ... because it's about $10k to retrofit all the pieces. I have the mirror caps and rear spoiler on the way already, and will do the rest soon. Then, yesterday the sun popped out for a bit ... so I had to pull off and snap a few. This green is amazing under direct sunlight, and I love how it changes with different conditions. Last edited by Rob O; 02-19-2019 at 08:44 AM. Beautiful color and a great choice! What felt better about the RS 5 Sportback compared to the RS 5 Coupe? Also how would you compare the acceleration of the RS 5 SB compared to your S5 SB? I would completely agree that that pictures don't do justice to the RS5 SB. 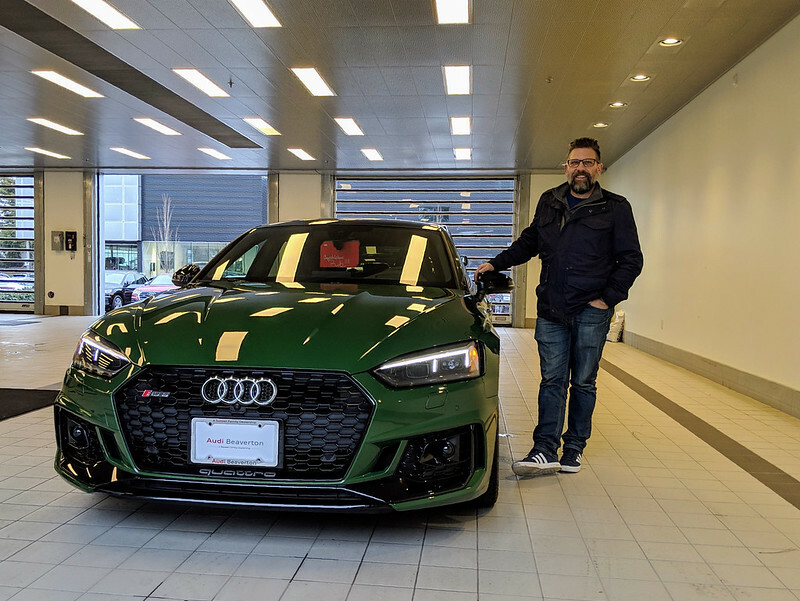 I picked mine up last Thursday in Sonoma Green. I have the same specs as yours plus the black badging. I luckily had a dealer find one already on a ship that they got redirected to them. When i pulled up to get mine delivered it was front and center and stood out. People were taking pictures of it. I like the green in that it's different but not in an in your face way. The only thing i don't love are the flag wheels that are on it. First world problems. Beautiful color and a great choice! What felt better about the RS 5 Sportback compared to the RS 5 Coupe? I'm not sure, exactly. Driving the coupe just left me felling 'meh'. It didn't feel like $20k more car. Performance didn't wow me, the ride felt a bit firm (and my S5 was on Abt HAS at nearly their lowest setting) and I wasn't a fan of the coupe styling anyway, so there may have been some unintentional bias. Or maybe I was just happy with my S5 SB and couldn't see the point on that day, which was still months from an RS5 SB arriving anyway. Also how would you compare the acceleration of the RS 5 SB compared to your S5 SB? I wouldn't say going from the S5 to the RS5 is night and day. Rather, it's like an upgrade from business class to first class on an international flight. It isn't just about "more power" either, but rather having more *usable* power and power that's more readily available. The 2.9TT doesn't suffer the lag experienced with the 3.0T (in Drive). And yes, you can feel the extra power too. The RS5 drives in D mode more like the S5 in S mode; it's crisp, responsive and with better gearing. In S mode, the RS5 is a different beast. I drove my S5 in S almost all the time, because it was more responsive (reduced lag) and I like the noises it made from the AWE Touring exhaust. With the RS5, I see S being reserved for spirited driving and D being used most of the time. It's odd, because it feels so familiar from behind the wheel, and yet the driving experience is notably enhanced due to the power bump, twin turbos, transmission changes and steering input. One downside, that'll be easily fixed, is the suspension. Stock, in Dynamic mode, the ride is pretty harsh. As with the coupe I sampled, the ride is harder than my S5 was lowered on HAS springs (even when set to Dynamic). I look forward to getting a HAS setup on this car. Last edited by Rob O; 02-19-2019 at 04:24 PM. I would completely agree that that pictures don't do justice to the RS5 SB. 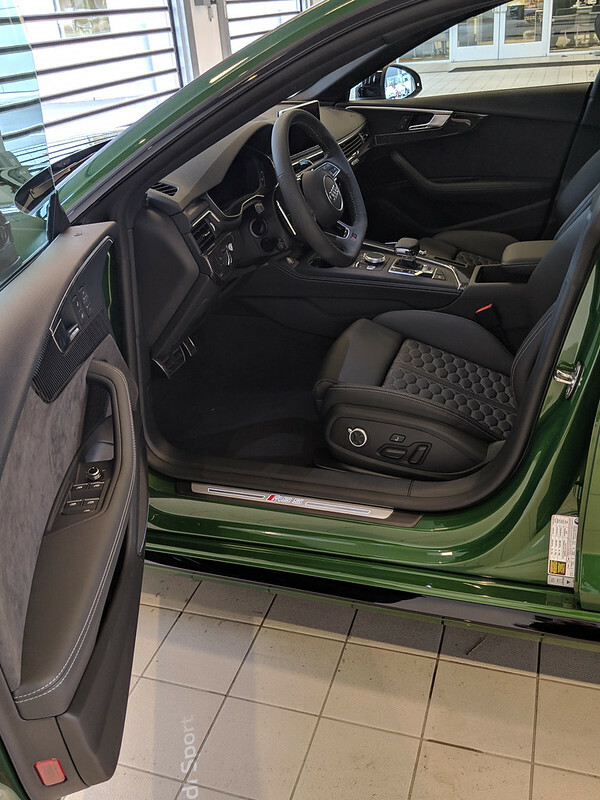 I picked mine up last Thursday in Sonoma Green. I have the same specs as yours plus the black badging. I luckily had a dealer find one already on a ship that they got redirected to them. When i pulled up to get mine delivered it was front and center and stood out. Congrats. That's I guess one of the things I alluded to in my write up, was how I'd still be waiting for my car had I ordered in Sept rather than driving a car I picked out of a production schedule a month ago. Heh. People were taking pictures of it. I like the green in that it's different but not in an in your face way. The only thing i don't love are the flag wheels that are on it. First world problems. As for the wheels, I've come to really like these. First, they're forged monoblock -- not cast -- and that's a good thing. Plus, the barrels being black means they hide brake dust well. 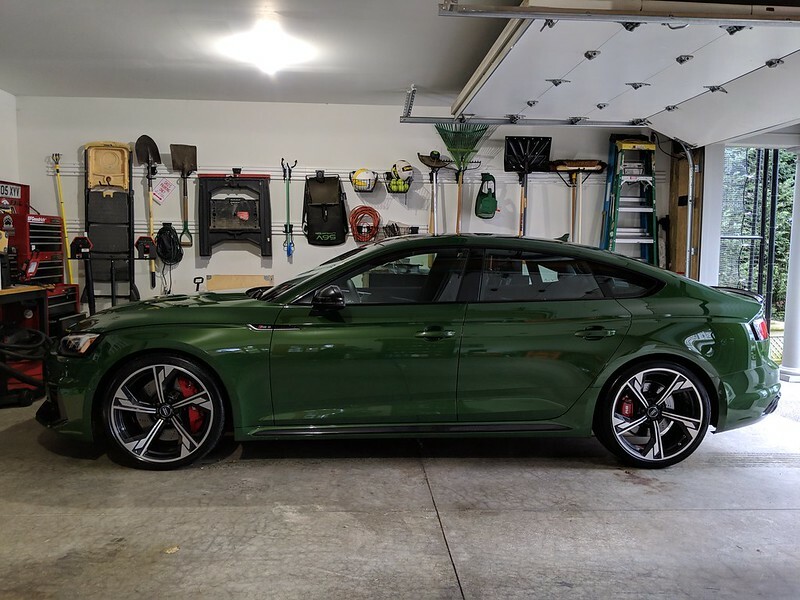 Prior to delivery I'd planned to drive it straight home and swap to the RS5 5-spokes I had on my S5 (with winter tires), but these have grown on me and I may leave them for winter duty. Still deciding what to have built for summer. i haven't gotten the chance to drive it too much yet since we got a bunch of snow over the weekend. Don't want to pick up snows this season yet since it's so late. I'll limp along. I did order some ceramic coating yesterday so will do that myself this spring. Hoping APR cracks this ECU sooner than later. I've always had good luck with them so will wait. Congrats again Rob. So glad you made the switch. I wouldn't say it's night and day. Rather, it's like a power upgrade. And it isn't just about "more power", but having more *usable* power and power that's more readily available. The 2.9TT doesn't suffer the lag experienced with the 3.0T (in Drive). And yes, you can feel the extra power too. The RS5 drives in D mode more like the S5 in S mode; it's crisp, responsive and with better gearing. In S mode, the RS5 is a different beast. I drove my S5 in S almost all the time, because it was more responsive (reduced lag) and I like the noises it made from the AWE Touring exhaust. 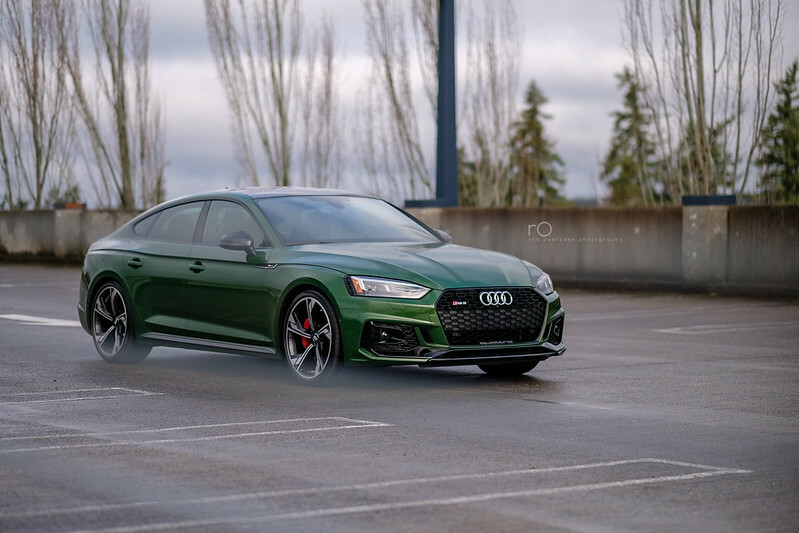 With the RS5, I see S being reserved for spirited driving and D being used most of the time. Good deal! Nice to get a real comparison from someone who owned both the RS 5 SB and the S5 SB. 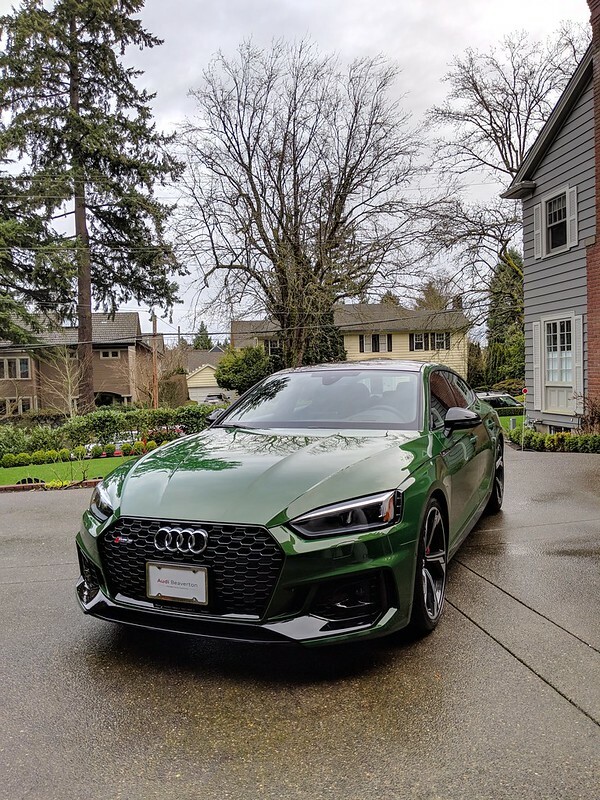 I own the RS 5 SB and have only test driven a S5 SB which isn't enough time for a fair comparison. I have no complaints in D mode. I drove my car in Comfort D mode for about the first 800 miles. I didn't switch over to Comfort S mode until around 850 miles. Smooth linear acceleration in D mode and I feel no lag. If you floor it in D mode I can see how you will feel some lag but then you're not driving the car the correct way. In Auto mode the difference between D and S is even more apparent as you hear the exhaust open up in S. I just broke 1000 miles yesterday and played around in Dynamic S mode on my way home from work. That definitely put a smile on my face. When I arrived at home my wife says "you got home faster then usual today" and my response was "my new car is a beast" lol. Rob - Really glad you're happy but I will miss pictures of your 2018 in that gorgeous blue! Congrats. I have to admit, the SB looks very good. I saw a Sonoma Green at the SF Auto Show. The color wasn't for me, but maybe that had to do with the artificial light. I think the design works much better than on the coupe. Regarding the differences, you hear similar comments from Europe about the RS4. Many who have driven both the RS4 and the RS5 coupe say that the RS4 drives and sounds better and is a better car. Some of it comes down to the longer wheelbase of the RS4 and SB. Gives the car a different character. 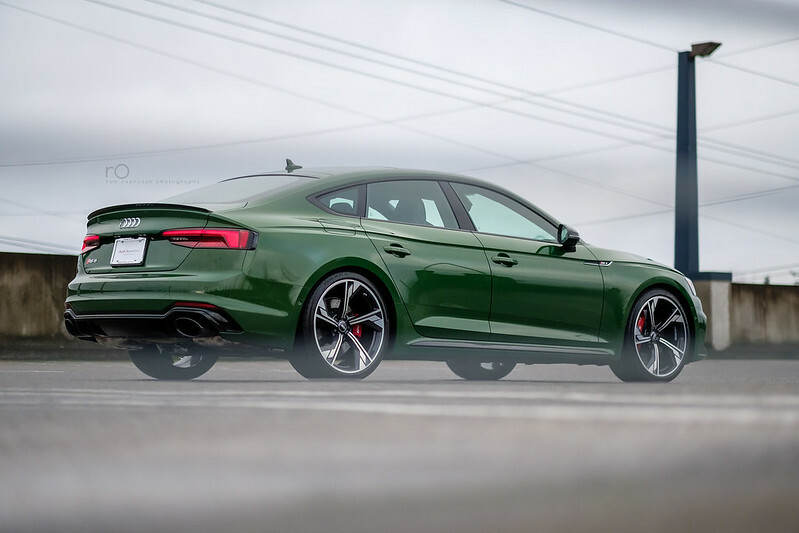 I suppose Audi Sport has taken the generally lukewarm impressions of the coupe to heart and went back to tweak a few things with the RS4 and now the RS5 SB. 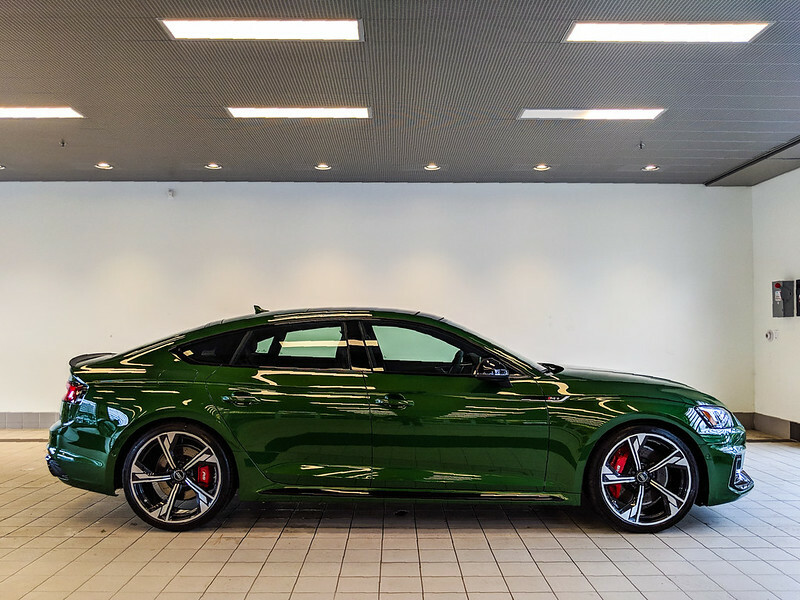 Quick Reply: My Sonoma Green RS5 Sportback - The Greenback?